Image: Michelle’s tweet cloud. 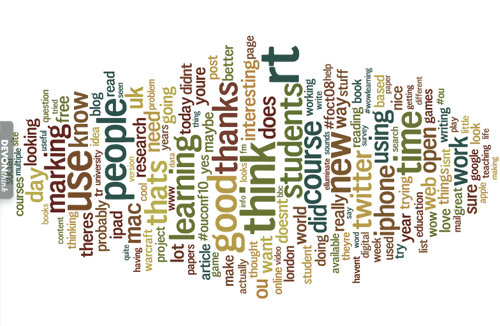 Most used words: thanks, RT, good, learning and marking. Niall Sclater posted an article on his blog yesterday about personality and tweet clouds. Inspired, I ran used Wordle of my top used words. TweeetStats, like many text analysis tools, uses a stop list, removing common words like “and”, “the”, “a”, etc. TweetStats gave me the option of additionally removing the names of people to whom I was replying, so terms like “@psychemedia” and “@AJCann” have also been excluded. It could use some better stemming. “Courses” and “course” appear as separate entries, as do “game” and “games”. Lyrics from Defying Gravity, out of the musical Wicked.